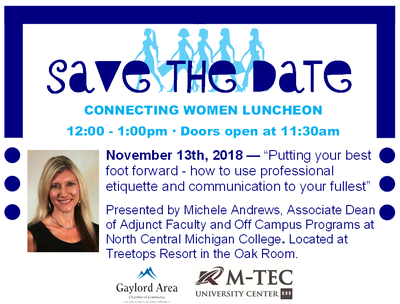 On November 13, 2018 women from all over Otsego County will gather at a to be determined location for a luncheon that will feature Michele Andrews of North Central Michigan College, presenting on "Putting Your Best Foot Forward". This is a wonderful time to meet other like-minded women who have new and fresh ideas which can help you refresh your own business. The best part?-- You'll like it too. Michele Andrews recently accepted the role of Associate Dean of Adjunct Faculty and Off Campus Programs for North Central Michigan College. 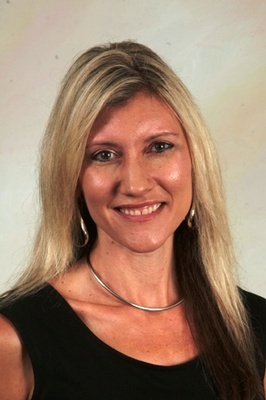 Prior to that she served as the Director of Off Campus Programming with North Central since 1998. Earning her undergraduate degree from Central Michigan University with a major in Journalism; Public Relations and Communication, Michele went on to complete her Master of Arts in Organizational Management from Spring Arbor University. Michele has been an adjunct faculty member for both North Central and Spring Arbor university since 2002. Teaching classes in the subjects of Interpersonal Communication, Public Speaking, Customer Service, Employability Skills and Organizational Behavior. Over the years she has been an active member of Rotary, the Cheboygan Economic Development Group and has served as past Vice-President of the Cheboygan Chamber of Commerce board of directors, Straits Area Services board member, Gaylord Chamber ambassador, American University Women in addition to other community driven committees and volunteer efforts. Michele’s past times include spending time with her husband of 19 years, Bob where they can be found traveling, boating and enjoying life in Northern Michigan.